USAID Supporting Forests and Biodiversity Project receives Royal Order of Sahametrei. Winrock International has been awarded the Royal Order of Sahametrei, the highest honor the country bestows upon foreigners. 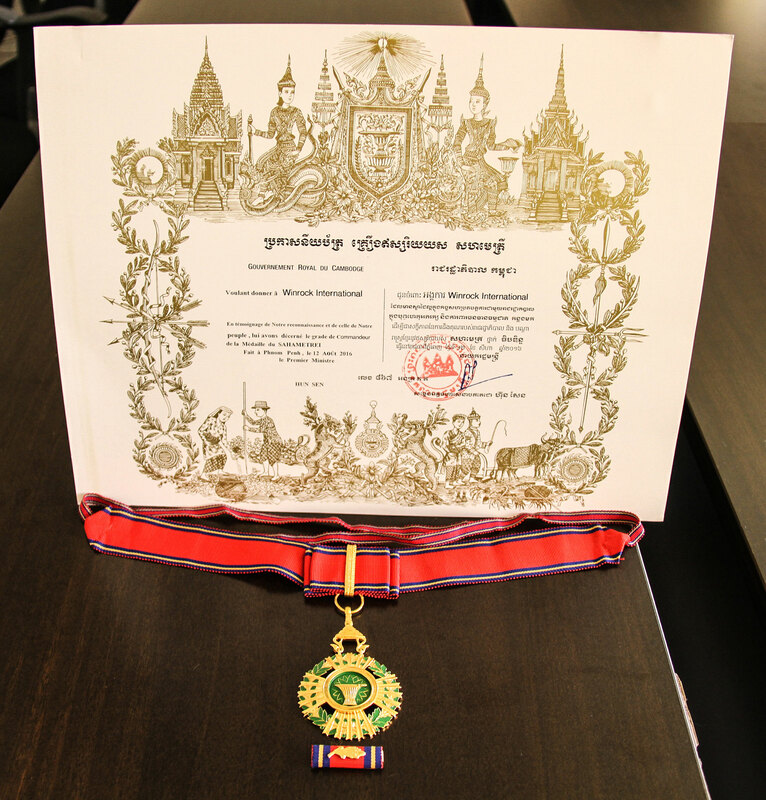 This honor, signed by Cambodian Prime Minister Samdech Hun Sen, recognizes outstanding service to the king and people of Cambodia in the fields of external relations or diplomatic services. In Khmer, the official language of Cambodia, “Sahametrei” means “joint cooperation” or “peace.” The Royal Order of Sahametrei is akin to a knighthood and is given to only a select few each year. This royal recognition commends Winrock’s work on USAID’s Cambodia Supporting Forests and Biodiversity (SFB) project, which has been conserving Cambodia’s biodiversity and forest resources since 2012. The country seldom singles out an organization for this award, says SFB Chief of Party Curtis Hundley. “What is special about this [honor] is that it was awarded to the organization, Winrock International, rather than … an individual,” he says. According to Hundley, the Cambodian Minister of the Environment likely proposed Winrock for this award due to the “great working relationship” the organization has developed with the ministry. Joel Jurgens, SFB deputy chief of party, agrees. He notes SFB’s close working relationship with the Ministry of Environment, especially during the past six months as the Cambodian government transferred all natural resource management activities from the Ministry of Agriculture to the Ministry of Environment. The SFB team learned about the award when it received a call from Kong Kimsreng, Winrock’s counterpart at the Ministry of Environment, asking the team to receive the award certificate and medallion. “Wishing to give Winrock International a testimony of our gratitude and that of our people, we have awarded them the rank of Commander of the Medal of Sahametrei,” the certificate reads — in both French and Khmer. The SFB project empowers government officials, NGOs, business interests and communities to become champions for sustainable forest management practices that benefit people and the planet. The project has conducted extensive assessments to support wildlife and biodiversity research and has improved the planning and management of more than 900,000 hectares. Whether it’s teaching villagers in Kampong Thom province to produce their own resin torches or developing a digital tool to analyze ecosystem concerns, SFB makes a daily difference in the lives of the Cambodian people and the health of the environment.